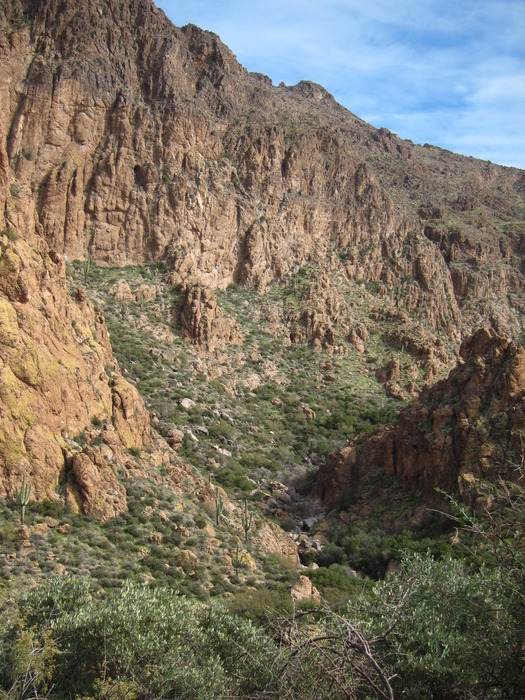 Overview: This is a delightful loop for a long dayhike or medium 2-night backpacking trip in the popular Superstition Wilderness. 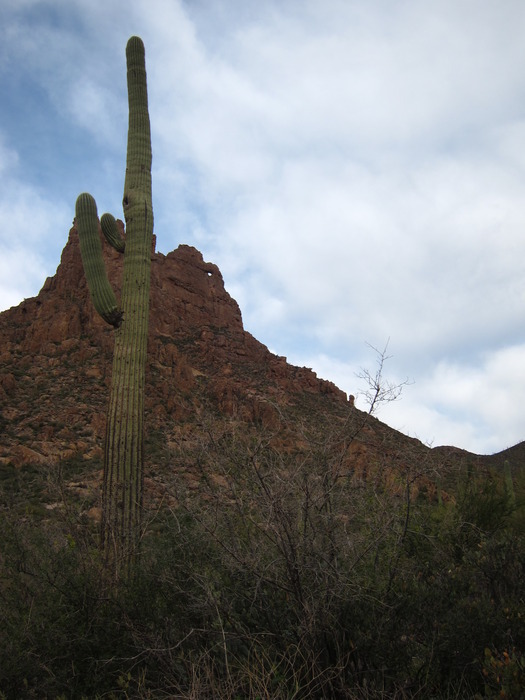 It provides amazing views of landmarks like Miner's Needle, Black Mountain, Bluff Spring Mountain, Weaver's Needle and the hoodoos of the Superstition Ridgeline. 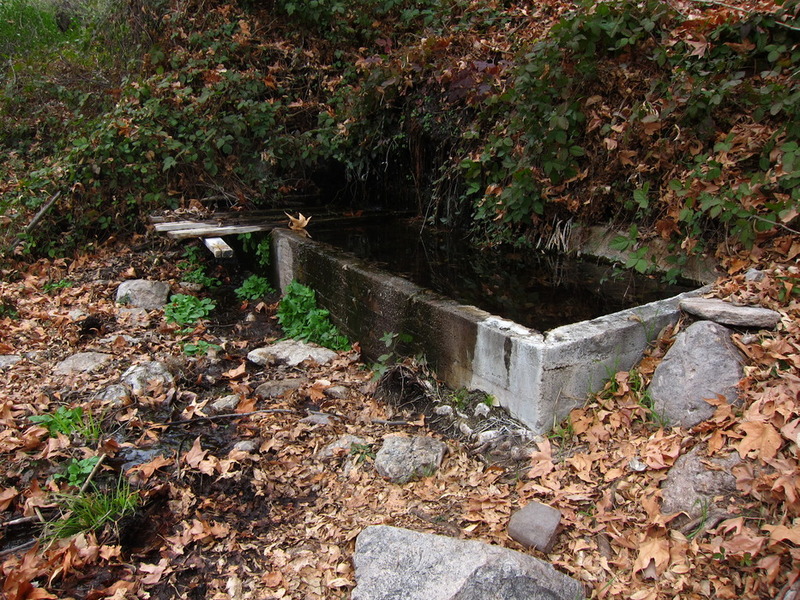 In winter 2012, there was water in all of the named springs enroute, and perhaps a dozen first-rate campsites throughout the hike. I felt like there were many canyons and peaks that I wanted more time to explore. Hike: We completed the loop counter-clockwise, starting on the Dutchman's Trail #104 and ending on the Bluff Spring Trail #235. However, in retrospect we think the hike might be done better in reverse - that gets the big climbs done the first day and uses the more gentle grades for descent. However, the description will match our route so I don't get horribly confused. 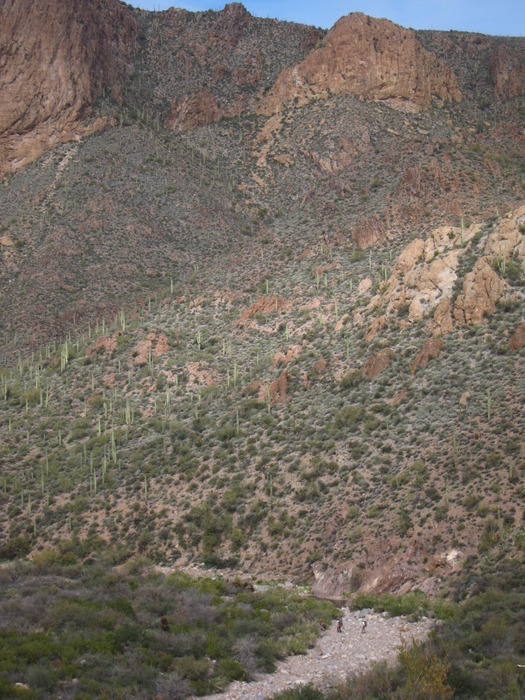 From the Peralta Trailhead, it's approx. 2 1/2 miles of smooth sailing across the northern edge of the Barkley Basin. The views along this stretch are long if not spectacular, with the wide basin stretched out at your feet. In the far distance I could just make out the top of Picketpost Mountain to the east. The first (of many) junction is with the Coffee Flat trail, which continues along the basin edge. 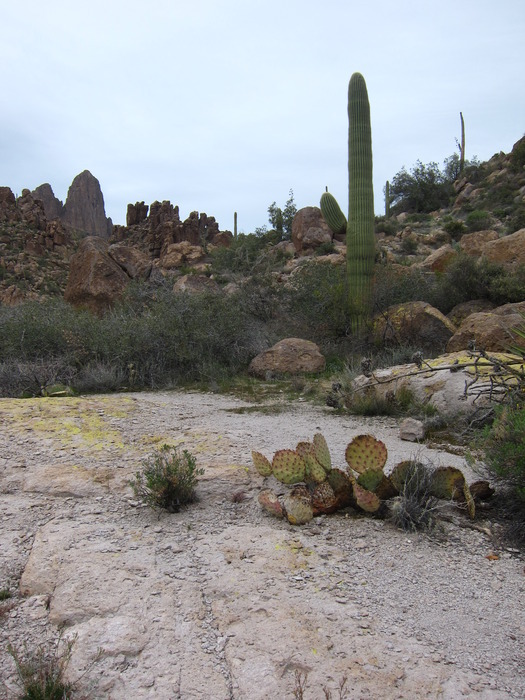 The Dutchman trail turns abruptly north, however and begins to climb up onto the east shoulder of Miner's Needle. Spend some quality time with pictures of the needle and it's tiny eye climbing up to the junction with the Whiskey Spring trail, which at 3280' is the high point of the hike. Of course, this isn't the last time you'll hit that elevation on this roller coaster ride, so don't think your uphill days are done! Staying on Dutchman again, head back down the gradual descent into the upper arms of La Barge canyon. This area is a maze of small drainages and low hills, and it seems to continue as far as your eye can see. The trail map, too, is a maze, with a big hole around Bluff Spring Mountain. Joe says it can be summited off the south slope, and the triplogs seem to agree, but I'm going to have to leave that for another trip. 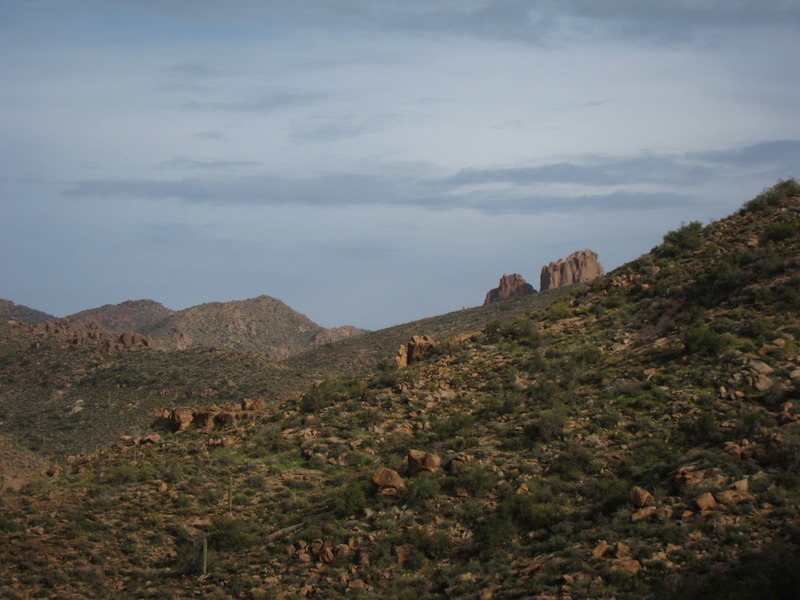 Although the Dutchman intersects the Bluff Spring trail a little over a mile past the the saddle (about 5.4 mi into the hike), you want to keep that trail for later and stick to the Dutcman's northerly descent. Bluff Spring is on the map high above the trail, but we didn't look for it. 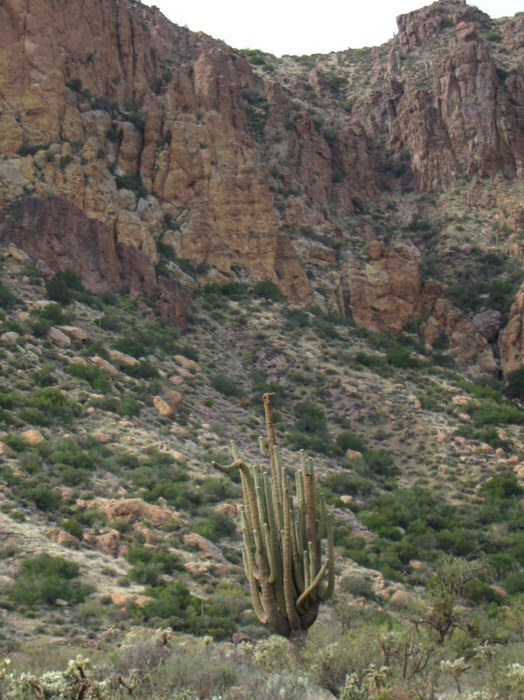 The huge old saguaro of many HAZ photos stands nearly alone about 1/4 mile off the trail. This venerable giantis one of the largest, potentially oldest specimens I've ever seen. After passing Holmes Spring (approx 6mi in), the floor of La Barge Canyon started to flow on and off with clear water - though the streambed was choked in many places with bright green algae. 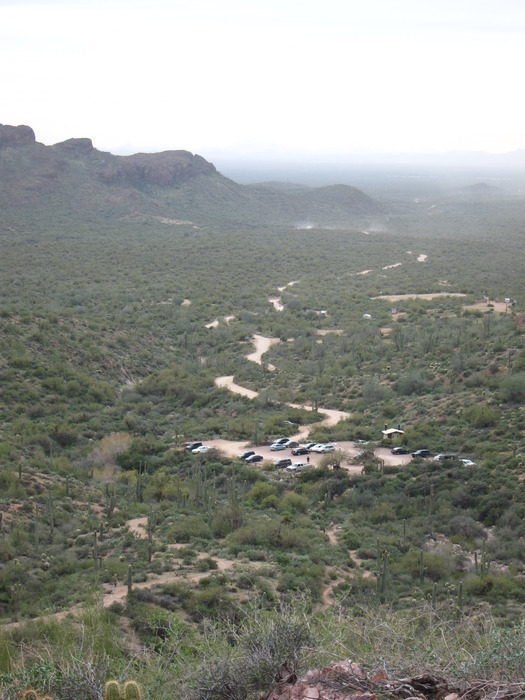 The spacious campsite at La Barge Spring is actually a short walk up the Red Tanks Trail #107 from the Dutchman junction, about 7.5 miles from the trailhead. The area has room for a number of tents and hammocks, but the impact from overuse is obvious. Please practice leave no trace. The spring box/trough is across the creek and up a steep (vertical) bank. Just up the trail a quick 10 minute walk is another large campsite near where the map locates Oak Spring. 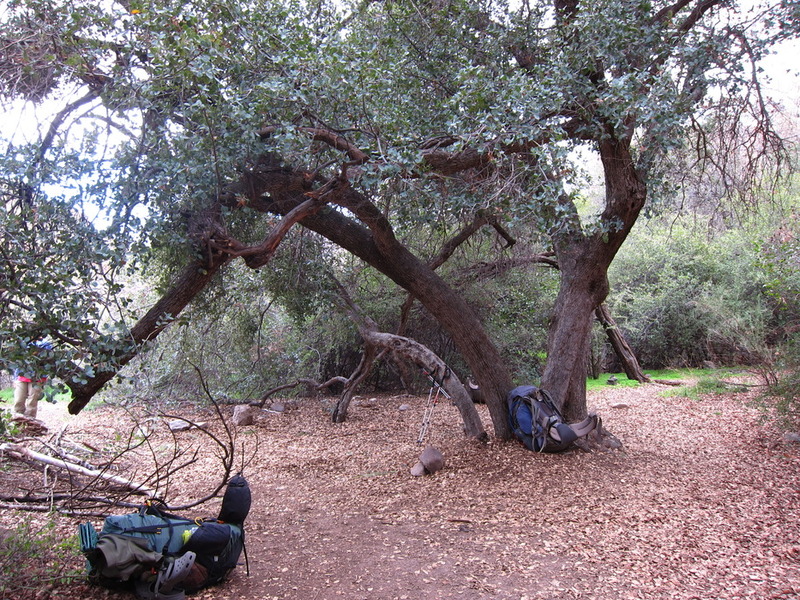 We didn't find the spring, but the campsite was thick with old oak trees, hackberries and mesquite. The creek was running gently and the campfire ring was large enough to accommodate our group of 7. Past Oak Spring, the trail stays high on the east wall of La Barge canyon, ducking in and out of bosques and open stretches. The confluence with Music Canyon is particularly scenic. Approximately a mile from La Barge Spring, the Peter's Trail comes in from the east, and the Dutchman turns to follow the canyon west. Just past this junction is the confluence with Charlebois Canyon and another large campsite at Charlebois Spring (9mi from TH). We found Charlebois to be somewhat less attractive than La Barge, though it seemed that it could accommodate a larger group. 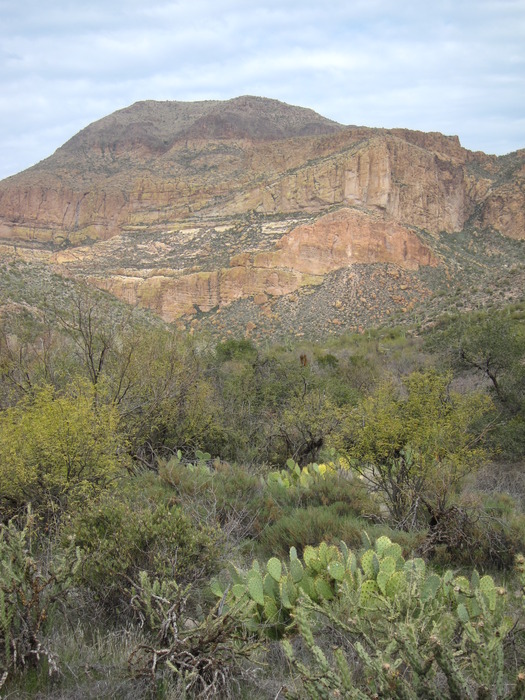 The trail continues along the base of the buff colored cliffs and rugged slopes of La Barge canyon, past the junction with the Cavalry Trail (10.4mi), the Bull Pass Trail (10.8 mi) and on to the junction with the Terrapin Trail #234 at Needle Canyon (11.3 mi). Views from this area of Black Mountain are fantastic. Turning south now onto the Terrapin Trail the climbing begins again. At the Bull Pass junction, you're only a hundred feet or so above the level of the trailhead, but you've got to climb back up to that 3280' again and descend once more before you're home. The trail begins climbing up and over a series of passes high above the scenic and rugged Needle Canyon. This canyon is narrower and steeper than La Barge, and provides amazing vistas to take your mind off of the steady (if not horribly steep) climb. Views from Terrapin Pass open up to the south, and on a clear day I imagine Canyon Lake would be visible (I could just make it out through the haze). 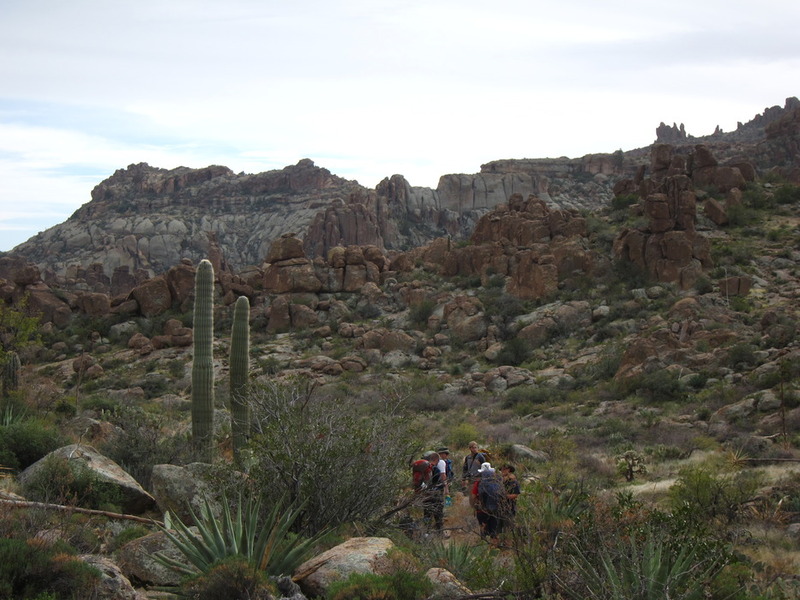 From this pass, the trail descends to cross the floor of the canyon on the eastern slope of Weaver's Needle, and then begins to climb again up to Bluff Saddle. Although the view from the second saddle is not as dramatic, this is where the fun rock hoodoo action really begins as you enter the high basins of Barks Canyon. At just over 14 miles, the Terrapin Trail ends at the Bluff Spring Trail, once again at the 3280' elevation mark. 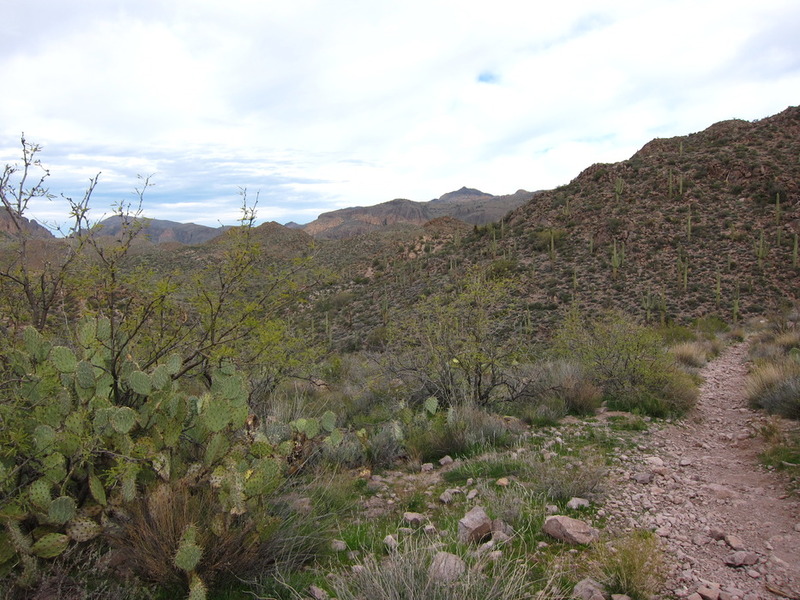 Although the trail map says that Bluff Spring Trail takes only 2 miles to reach the Peralta Trailhead from this point, it seems impossible. The trail continues to descend and climb repeatedly as it crosses through Barks Canyon, up and over the rugged south face of the range. This is the most exciting 2 miles of the whole trip, with scenery changing every twenty feet or so. Weaver's Needle and Miner's Needle bob in and out of view until, finally, you can see the trailhead almost directly below you. The final descent is truly steep and - after the miles of up and down all day, a bit cruel as a finish. But with your car in sight, it's smooth sailing all the way home! 7.6 miles east of the junction Idaho Rd / US-60. Turn Left on to FS77 which is Peralta Road. Follow FS77 5.6 miles to a left and up turnoff. Continue 1.9 miles to Peralta Trailhead. The trailhead has restrooms minus running water. The parking lot is huge. It does fill up in season on weekends. Since there are no lines the rangers ask that you park straight between the posts in the main lot. Please do your part with this simple request and make room for the next guy. 0.5 miles before reaching the trailhead is an overflow lot which is also suited for horse trailer parking.